Journal of the Folk Song Society, Vol. 2, pp. 128-131. Article by Lucy E. Broadwood. Oh, righteous Joseph wedded was. Note: for the full song, see Christmas Mummers' Carol 1. From Mr. A. Glaysher, Cumber's Farm, Trotton, Rogate, Sussex, who heard it sung "over forty years ago," and in writing says that it is called "Richous Joes." Note: for the full song, see Christmas Mummers' Carol 2. The above is from Mrs. Small of Smith's Brook, Lodsworth, near Petworth, Sussex. She has known the carol from childhood, and is now sixty-two years old. Note: for the full song, see Christmas Mummers' Carol 3. 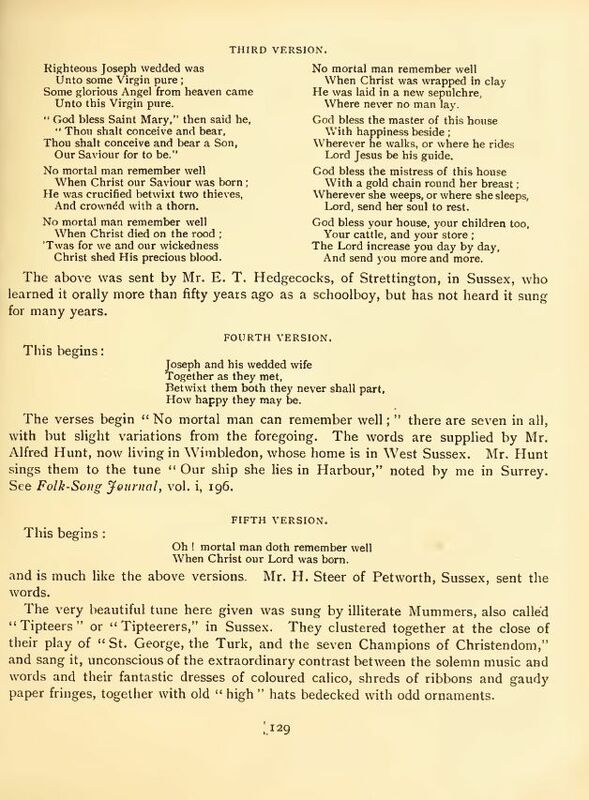 The above was sent by Mr. E. T. Hedgecocks, or Strettington, in Sussex, who learned it orally more than fifty years ago as a schoolboy, but has not heard it sung for many years. How happy they may be. The verses begin "No mortal man can remember well;" there are seven in all, with but slight variations from the foregoing. The words are supplied by Mr. Alfred Hunt, now living in Wimbledon, whose home is in West Sussex. Mr. Hunt sings them to the tune "Our ship she lies in Harbour," noted by me in Surrey. See Folk-Song Journal, vol. i, 196. When Christ our Lord was born. and is much like the above versions. Mr. H. Steer of Petworth, Sussex, sent the words. The very beautiful tune here given was sung by illiterate Mummers, also called "Tipters" or "Tipteerers," in Sussex. They clustered together at the close of their play of "St. George, the Turk, and the seven Champions of Christendom," and sang it, unconscious of the extraordinary contrast between the solemn music and words and their fantastic dresses of coloured calico, shreds of ribbons and gaudy paper fringes, together with old "high" hats bedecked with odd ornaments. I was able to note only exceedingly corrupted fragments of the words, and after 1881 the Mummers appeared no more. Two copies sent me by two of the actors (of the name of Hampshire) scarcely helped me. The word "sepulchre" was sung, and written, " music-port!" However, I patched together all the fragments, for the sake of including the carol in Sussex Songs. This year, in answer to an appeal of mine in the West Sussex Gazette I received five sets of words, here given. 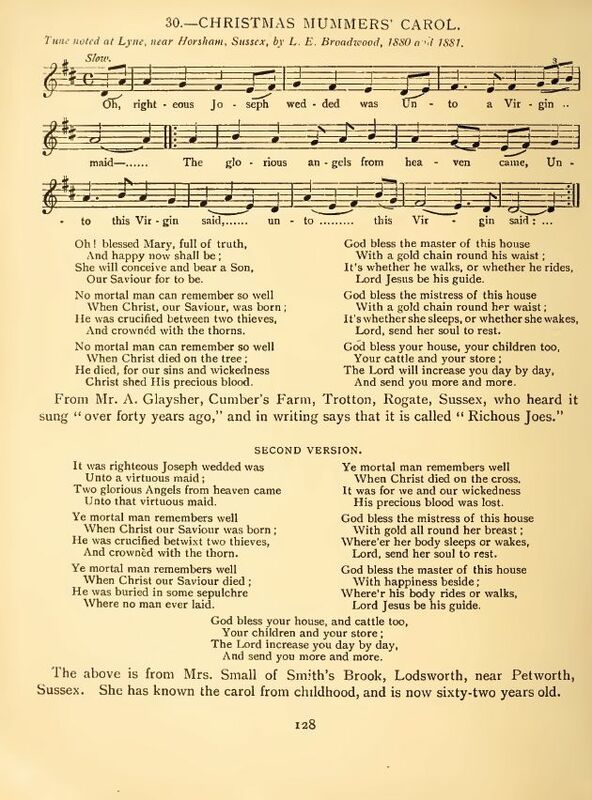 From a farmer near Battle I learned that he also used to sing the carol as a child. He could not "put together the words" unfortunately, but said that the verses should begin "Oh, mortal man, remember well," which certainly seems the most likely form of words. The Tipters sand "No mortal man remember well." I have been unable to find tune or words in print. 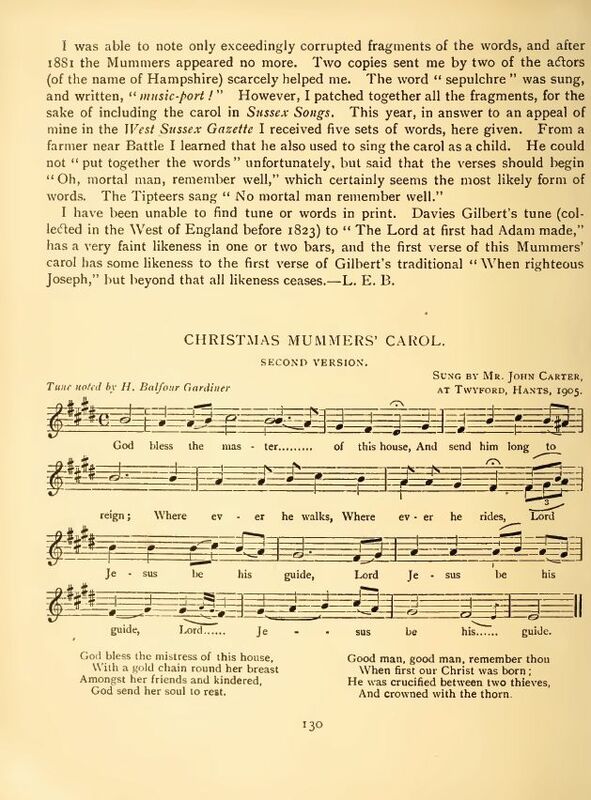 Davies Gilbert's tune (collected in the West of England before 1823) to "The Lord at first had Adam made," has a very faint likeness in one or two bars, and the first verse of this Mummers' carol has some likeness to the first verse of Gilbert's traditional "When Righteous Joseph," but beyond that all likeness ceases. -- L. E. B. 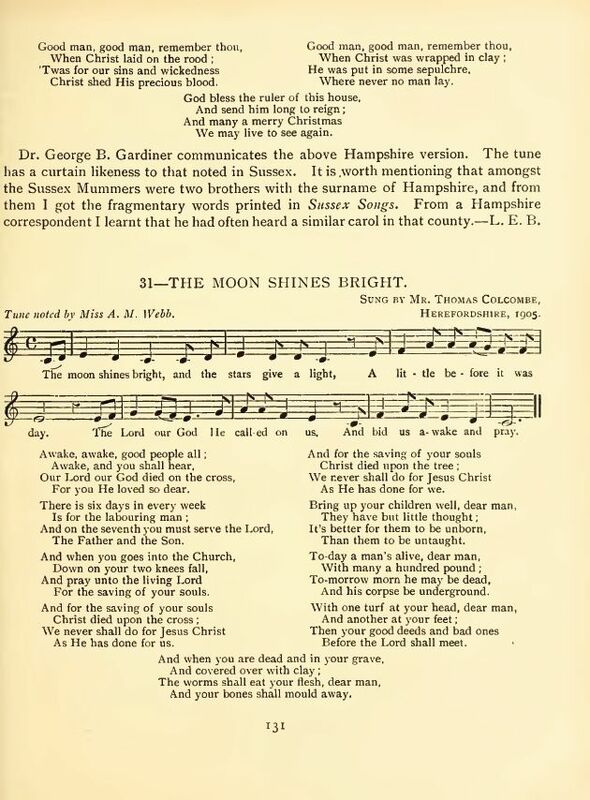 This was noted as one of several "doubting Joseph" carols by Hugh Keyte and Andrew Parrott including The Cherry Tree Carols, Joseph Being An Aged Man, Joseph Being An Old Man Truly, and Joseph Was An Old Man. See The New Oxford Book of Carols (Oxford: Oxford University Press, 1992), Carol #129, pp. 446-8.